fill remaining bag spaces with food in case he catches you! From boss island, Nex is usually at the farm. Shoot an arrow at him and start running towards the pond, he will follow you a bit, then shoot another arrow and keep running. 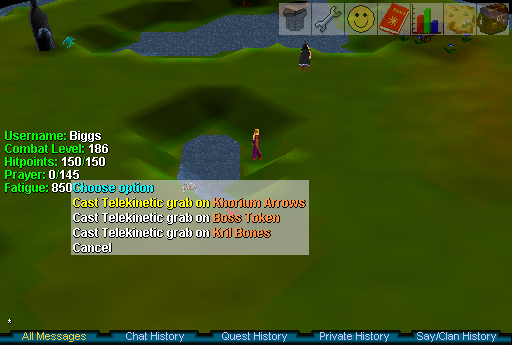 You are trying to get the pond between Nex and you, and optimally get Nex to be standing on the far side of the pond at the pufferfish spot. Once Nex is stuck, turn on your range potion and prayer and start chipping away at his HP. Telekinetic grab your arrows every minute, and quickly start ranging him again so he doesn't move away. He has massive HP but after a while you'll claim your reward of 20 boss tokens. You can actually do this with a longbow and a stack of bronze arrows, the important part is luring him across the pond and readjusting in case he moves. The boss tokens are worth quite a bit, as they are used to buy the best gear in the game. They have been known to fetch up to 1Mill each.